Radiographs, also called X-rays, provide important information about the condition of your teeth, roots, jaw, and overall facial bone composition. 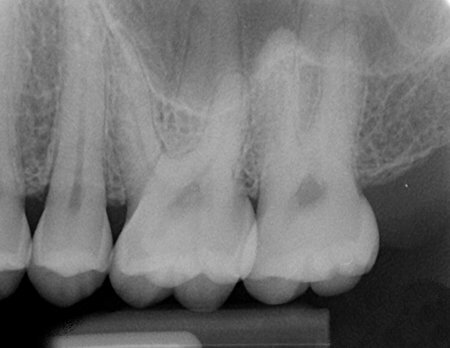 X-rays can reveal the advanced nature of periodontal disease, as well as tumors and abscesses. One of the most important roles of a dentist is the responsible prescription of dental radiographs. Dentists must weigh the benefits of taking radiographs against the potential harm that can be caused by radiation from any source. Dr. Moore takes this issue seriously, and has taken steps to ensure that overall radiation exposure to his patients is minimized while diagnostic information is maximized. As of November 1, 2006, all radiographs are now digitized. The result is a reduction in radiation exposure of up to 80%, while yielding approximately 10 times more diagnostic information. We still, however, take special care to ensure that lead aprons are used to prevent exposure to surrounding areas of the body such as the head, neck and upper chest. Bitewing radiographs are the most conventional kind of dental X-rays and are used to spot cavities and decay. Periapical radiographs are broad pictures of an entire tooth structure and are used to spot deep tooth problems, such as impacted teeth, bone loss, and abscesses. Panoramic radiographs are designed to capture an entire mouth, and have been used to spot tumors and cysts, as well as wisdom teeth. Cephalometric radiographs provide a lateral view of the whole skull and assist Dr. Moore in assessing the relationship of the skull, and upper and lower jawbones. These are used primarily in orthodontic diagnostic workups. A full mouth survey of radiographs every five to nine years depending on the state of their teeth, number and size of fillings, and presence/absence of periodontal disease. A full mouth survey consists of four bitewing radiographs and periapical view of root tips of all teeth. This allows for a complete assessment of the alveolar bone (the bone that houses the teeth), the overall health of the tooth nerve, and presence or absence of cysts/abscesses/tumours. Much of the pathology identified from full mouth surveys is asymptomatic, so without the radiographs it is impossible for Dr. Moore to diagnose problems. A panoramic radiograph once every five to ten years. This allows examination for cyst/cancer formations in the sinuses, skull bones and jaw joint, and also allows Dr. Moore to see if you have any plaque buildup in your carotid arteries (a sign of atheroschlerosis). Prescription of radiographs for children is even more patient-specific than for adults and is dependant on the cavity rate, state of physical and dental development, number and size of previous restorations, and oral hygiene of the child. Generally, children should have bitewing radiographs once every one to three years, and a panoramic radiograph as needed. In children the panoramic radiograph is used primarily to identify congenitally missing teeth, and/or to examine the third molars (wisdom teeth).